This series of paintings takes its inspiration from the theme of la Fête Champêtre – a pastoral festival, or picnic in the park. Eighteenth century French artist Antoine Watteau reflected on this theme, depicting men and women in elegant costumes eating and dancing in graceful settings with trees, ruins and distant views. 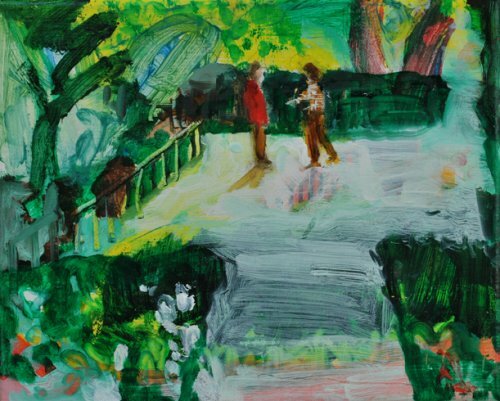 The artist has borrowed aspects of Watteau’s dreamy and romantic approach and have brought it up to date with her memories and observations of people in parks and gardens, often in positions of repose, alone or in groups deep in conversation. Many of her paintings feature a clearing surrounded by plant growth. This sense of interiority that appeals to her – a safe place in which to commune with nature and to celebrate with fellow human beings.